Yay, I got it to erase and write the save cleanly. All I had to do was erase 4 banks instead of 8 and write a bank after each erase (it writes again later and spits out read errors, but it works!). I tried to write a save reader, too, but can't figure out how to output to another file within the .z64 program. Seems easy to code that or fix the built-in reading function. - F-Zero X and Zelda OOT for SRAM. I only tested it on the Neo2 SD, I'm not sure if it will also work with the Neo2 Pro. If you could turn this into a more sophisticated tool for original cartidge save ram backup/restore tool (compared to menu's functionality) it would be VERY useful. I now have changed the SD access code from the one I took out of Chilly Williy's Simple Music Media Player to the one that comes with your Gnuboy64 and just call mount_card() which I hope will set the correct speed. It still works for me so that is a good sign. It works , but you shouldn't be calling mount card function directly. I found a nice flashram test program in the official SDK and after compiling it, it tells me that both my Majoras Mask and Pokemon Stadium carts have flashram of the "MX C" type while my Jet Force Gemini cartridge's flashram is "MX B or D". My JFG flashram has the following printed on the chip "29L1101KC" while the chip inside Pokemon Stadium chip "29L1100KC". Overall there seem to exist Macronix A, C, B/D and Matsu****a flash chips. The official SDK detects them by their ID and probably chooses the way to read/write to them accordingly. Now I need to find a game with a Macronix A and one with a Matsu****a flashram to see if and how they behave differently. And as a bonus it would be nice to find out how to read the flashrams ID. Sadly Nintendo's libultra is not open source so I can't have a look how it handles the different types. Do you run this code independently or does it get incorporated in the Manager software? Would like to back up both Stadium 1 and Stadium 2. Anyone know if there is a Stadium sav editor in the works? It's an independent program, you download the N64SAVERW BETA2.zip file from reply #33, extract it and put the N64SAVERW rom on your SD card. Then you launch it from the Neo N64 Myth Menu. 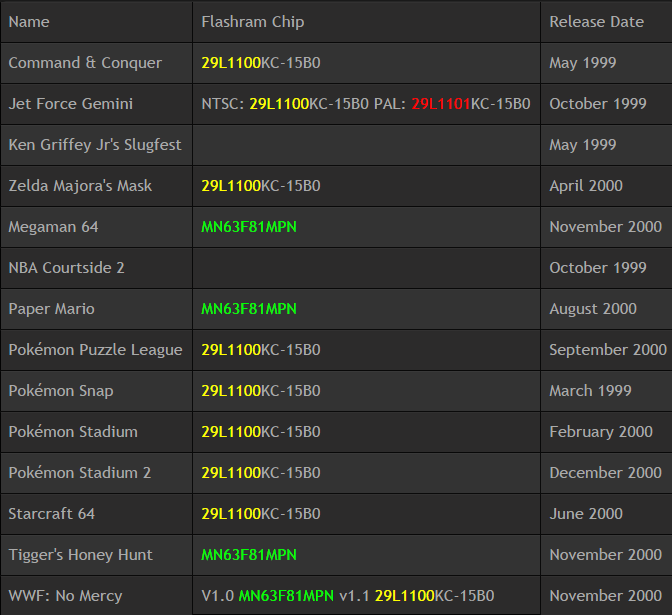 So far I have implemented 2 of the 3 major flashram chips, here is a list of what game uses which chip. The games where the flashram chip is written in green color probably can't be dumped yet because I didn't buy a cartridge with that chip yet to test and modify my code. In the program 29L1101KC should be dumped with flashram type 1 and 29L1100KC with type 2 if I am not mistaken. MN63F81MPN will be type 3 once I have aquired a cartridge with that chip. Oh and if anyone has the two missing cartridges Ken Griffey Jr's Slugfest and NBA Courtside 2 and would be so kind to open them and tell me what flashram chip they have, that would be great. The Legend of Zelda Ocarina of Time has a battery. Do you know if your program with backup this cart in the event the battery needs to be replaced? If you want to backup and restore save games from/to N64 cartridges the easiest way is to buy a Neo N64 Myth flash cart and use my N64 SAVE Reader/Writer BETA2 program I attached in this post. It is still in testing stage so there might be bugs and not everything might be working. Question: I haven't used or copied anything to my N64 Myth Cart yet, and I don't have Windows XP. As someone who's never used the flashcart before, how would I set it up so I can use it to dump a Pokemon Stadium 2 (Pokemon Stadium GS) save file to an SD Card?